888 Poker is part of the large 888 gambling site, where you can also enjoy casino games, sports betting and bingo. You can download a poker client or play directly in your browser. The downloadable poker client only works with Windows. If you play directly in your browser, you do not get access to the pokercam tables. 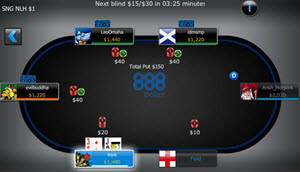 888 Poker has special Push or Fold tables for Texas Hold’em and Omaha. At such a table, the buy-in is not larger than a few big blinds. Since you come to the table with so little money, you are forced to play more aggressively. 888 Poker has a good assortment of tournaments and there is something here for everyone, from free rolls to high stakes buy-ins. During the weekends, there are tournaments with really big guaranteed price pots. For most of the high buy-in tournaments at 888 Poker, satellites will be available. 888 Poker continuously run satellites for major offline poker events, such as World Series of Poker (WSOP), European Poker Tour (EPT), Aussie Millions and Asian Poker Tour (APT). It is possible to play your way to a travel package that includes buy-in to the Main Event, air plane tickets, hotel accommodation, pocket money, and more. Despite just having five poker rooms in the network, the traffic is massive and the 888 Poker network is currently listed as #2 on PokerScout’s list of the online poker rooms and poker networks with the most traffic to the cash game tables. When you register with 888 Poker, you get a $8 no deposit welcome bonus. When you make your first deposit to 888 Poker, you get a 100% bonus up to a maximum of $400. Participate for free in a Welcome Tournament with a $1,000 price pot. Participate for free in seven other Welcome Tournaments where each prize pot contains $500. Participate for free in a Depositors Tournament with a $1,000 prize pot. 888 Poker has a $50 recruitment bonus. Each time you make a deposit into your 888 Poker account, you become eligible to play for free in that week’s Depositors Tournament. Depositors Tournament is held each Saturday and has a $1,000 price pot. The English customer support is open 24/7. You can call or send an email (the address is support@888.com). From many countries, a free phone # is available, so that you don’t have to pay anything for the phone call to the 888 Poker support. Check with the 888 Poker site to find out more. 888 Poker can trace its history back to Pacific Poker, a pioneer poker site launched in 2002. 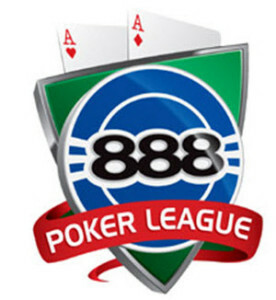 888 Poker is owned by Cassava Enterprises, which is a subsidiary of the large gambling company 888 Holdings plc.